Free Video Compressor is a free and lightweight video compression software that can compress almost common video files, it can help you to easily shrink a video clip and reduce video file size. 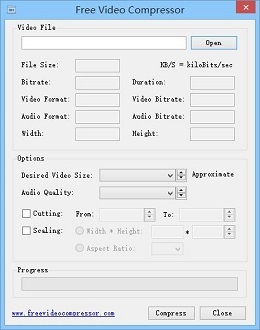 This software can work with many popular video formats, such as MP4 (MPEG4), MPG, AVI, FLV, F4V, M4V, WMV, MOV, MKV, ASF, RMVB (RM) and more. Freeware, clean and easy to use, free for personal and non-commercial use, get it from a file mirror. The basic usage is very simple, click on "Open" button to select a video file, then set a desired compressed video size, finally, click "Compress" button to start video compression. First of all, the most important option is "Desired Video Size". 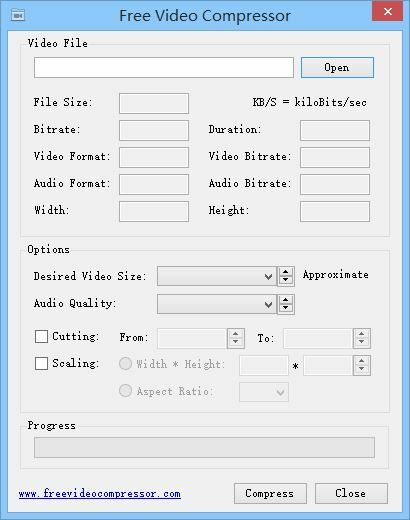 After software open a source video, it will read and show key video information, such as: File Size, Bitrate, Duration, Video Format, Video Bitrate, Audio Format, Audio Bitrate and Video Dimension (Width / Height), then software will calculate an estimated output video size, that is "Desired Video Size". This desired video size is approximate value, resulting file may be smaller or larger than this size, you can change this value as you need. (Bitrate information is displayed as KB/S, KB/S = kiloBits/second). The generated video format is MP4 container format with H.264 video codec and AAC audio codec. The encoding video quality is based output file size, output file size is more bigger and resulting video quality is more higher and more clearer. Furthermore, in order to get a smaller result, software also supports some useful compression options. Firstly, you can change output audio bit rate, because audio content will occupy some file space, you can set a smaller bit rate to reduce file size, or simply set audio quality as "No Sound", then output file will only include video content (silent). Secondly, by using "Cutting" options, you can choice a part of video, set a start time and an ending time, you can easily convert and compress a part of video. Finally, if you want to customize output video dimension or aspect ratio, you can use "Scaling" option, video dimension (width and height) must be divisible by 2, the supported aspect ratios include 4:3, 1:1, 16:10 and 16:9. By using this small tool, you can easily decrease your video file size by yourself, it can help you to save disk space, and share video clips with your family and friends on the Internet, or view these videos on your mobile phones and other handheld devices. In addition, this software uses a static build from the FFmpeg project (FFmpeg static build and FFmpeg source) under the LGPLv2.1 (GNU Lesser General Public License) . Copyright © www.freevideocompressor.com, All Rights Reserved.